Links for each picture can be found below. 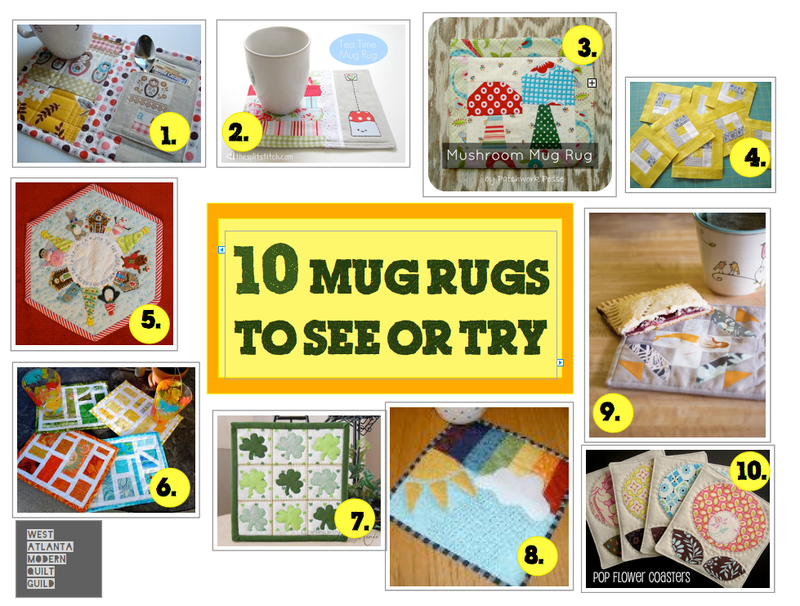 Now that we know what a Mug Rug is, let’s get inspired! The versitile mug rug can carry many themes and sizes, it is totally up to you how detailed you want to go! Here are some examples for you! This picture is from a tutorial called A Mug Rug of Scraps by Jennifer from That Girl…That Quilt. The tutorial is posted at Sew We Quilt. This mug rug is made just for Tea Time and is by Sara from The Split Stitch. It includes embroidery which, I would consider a extra dose of cuteness! The tutorial is posted at Wild Olive. This tutorial is from The Sewing Loft and involves mushrooms! Left over blocks? I found this picture on Pinterest and it suggested using Log Cabin blocks as Mug Rugs. More on the picture at Oh Frannson! Here is an example of a Holiday Mug Rug by the Flickr user Crktpot. No tutorial but still eye candy just the same. Try a pillow or quilt block tutorial by making a mug rug like SassyPacks. She used this tutorial by Oh Frannson! Wanna try some tiny stitches? Check out this pattern found on Craftsy.com. Here is another pattern offered by Craftsy. I love that site! This tutorial is by Ms. McPorkChop Quilts. She used one traditional block to make her mug rug. The block is called Christmas Star II. Here is the link. This tutorial is called Pop Flower Coaster by Bec who blogs over at Chasing Cotton. I know it says “coaster” but I made this particular coaster and it is much bigger then a coaster. For additional inspiration, I have created a Mug Rug Pinterest Board. If the above list did not get your juices flowing, the Pinterest Board will be of great help. I made a point to pin some additional holiday mug rugs too! Remember our next meeting is at Whipstitch Fabrics on 02/28 at 7pm. Mark your calendars and I hope to see you there! This entry was posted in Swaps and tagged mug rug, quilting, sewing, ten to see or try, tutorial by West Atlanta Modern Quilt Guild. Bookmark the permalink.